Today, I’m sharing the activities and games for the birthday party. We started the party with a simple craft to keep the kids occupied while everyone arrived. 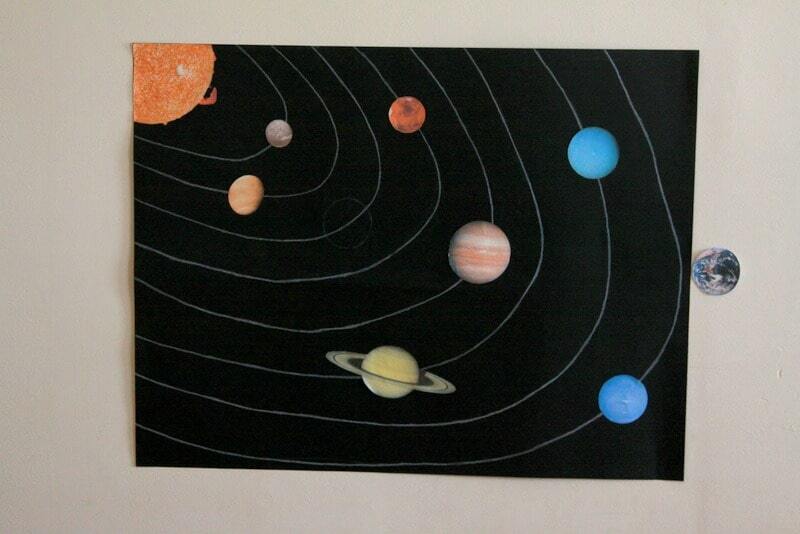 I put out black cardstock, glitter-glue pens, metallic pens and stickers of the planets. I cut the sticker sheets into individual or small groups of planets so there wouldn’t be fights over the sticker sheets. I didn’t have quite enough for one whole sheet for everyone. 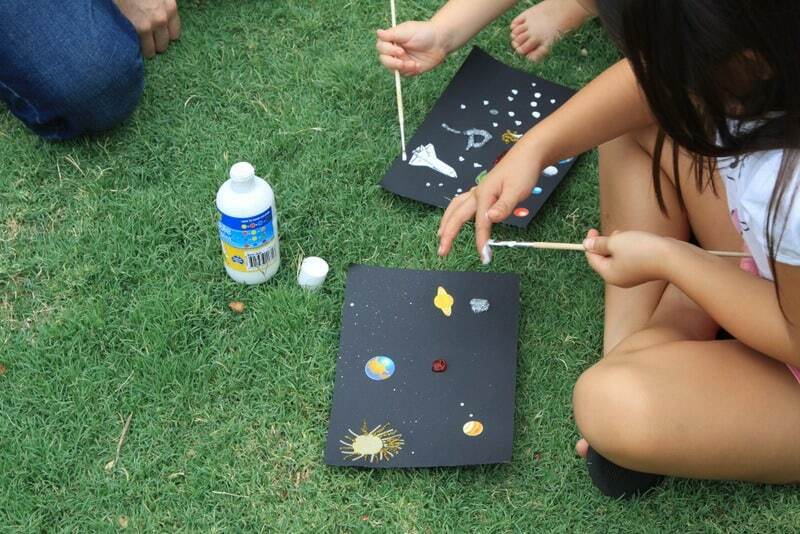 My artist brother-in-law then suggested we get some white paint and flick that on to the paper to create stars. He supervised that to make sure the kids didn’t get covered in paint. 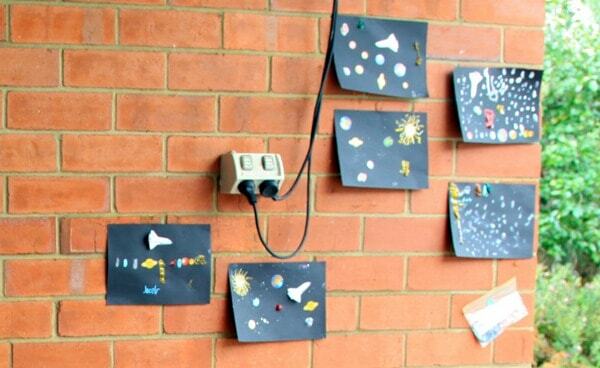 The solar systems were then stuck up on the wall to dry, and made a decoration for the party. The kids then took them home at the end of the party. When all the kids had arrived, the first game was Toss the Meteorite Into the Planet. 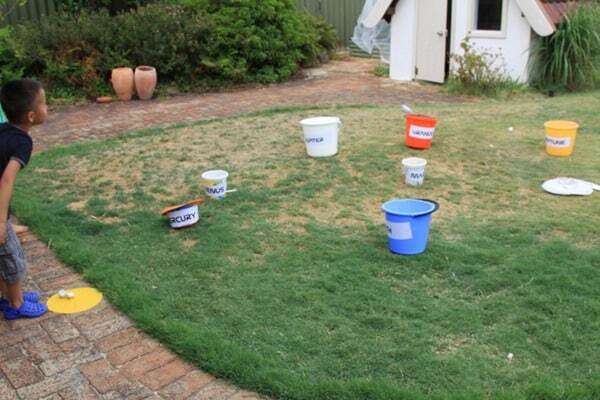 I set out a range of buckets and hats into a solar system, labelling each one with a planet and number, based on its position from the sun. I also stuck a yellow sun on the ground for the kids to stand on. Pieces of aluminium foil were scrunched up for the meteorites (bean bags would have worked well too!). Each child was given 4 meteorites. Standing on the sun, they had to throw their meteorites into a planet bucket. Points were allocated base on position from the sun. For example, Mercury was 1 point, Earth was 3 points, right out to Neptune, which was 8 points. We added an extra rule that you could only land a meteorite in each planet once. 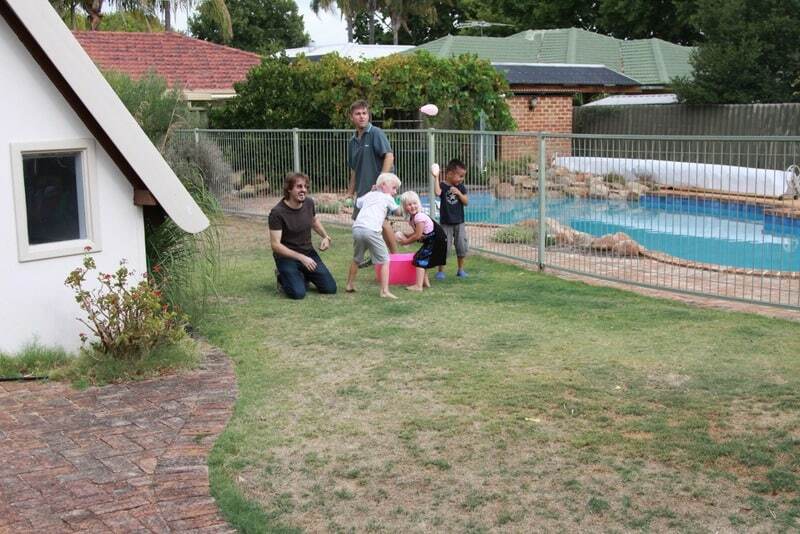 The kids had fun throwing their meteorites, although it was harder to land them in the planets than I expected. I wrote each kid’s name on the planet ahead of time, and stuck a piece of Blu-tak on the the back. We used airplane eye patches to cover the kids eyes, and did the standard spin three times, and go. There’s always one kid that gets in spot on – it always makes me suspicious that my eye covering hasn’t worked that well! Any tips? 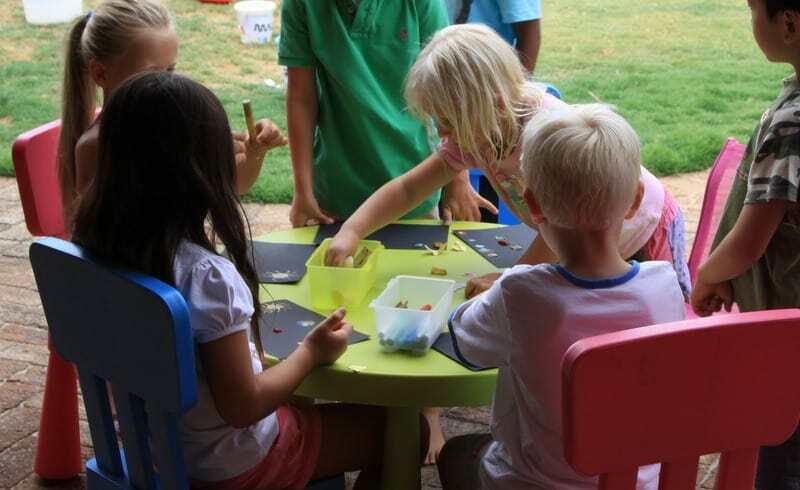 A treasure hunt is another simple activity for birthday parties. To get it into the space theme, I put small Milky Way and Mars Bars (of course!) 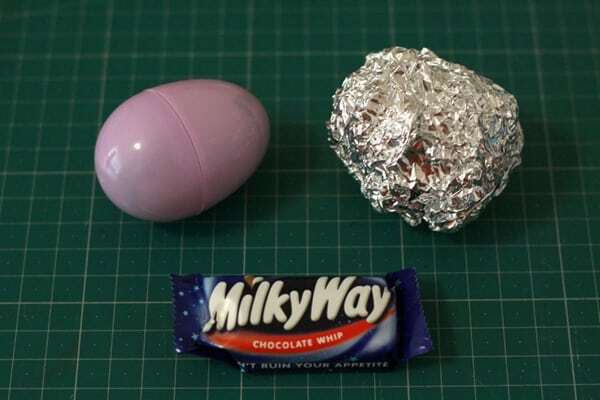 inside plastic Easter eggs (because I always have random craft supplies, but they weren’t really necessary), and then covered them in scrunched up aluminium foil. My husband hid them around the garden, and the kids had to find them. There was enough for one each, so when the kids found theirs, they helped the other kids. A couple of kids worked out there was something inside the moon rocks. Then I had other kids come up and say they wanted on with an egg. I had to tell them to unwrap theirs. It made me giggle! The chocolate was a bit melted in the summer sun, but that didn’t stop the kids devouring them! 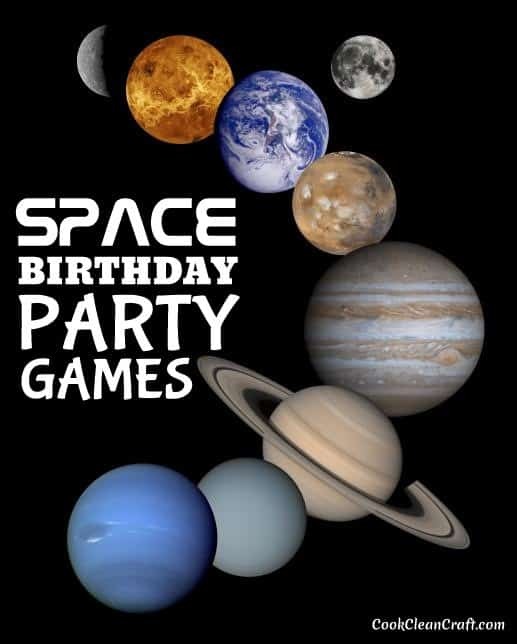 One game I had planned, but we never actually played was Musical Planets – a space-themed version of musical chairs. 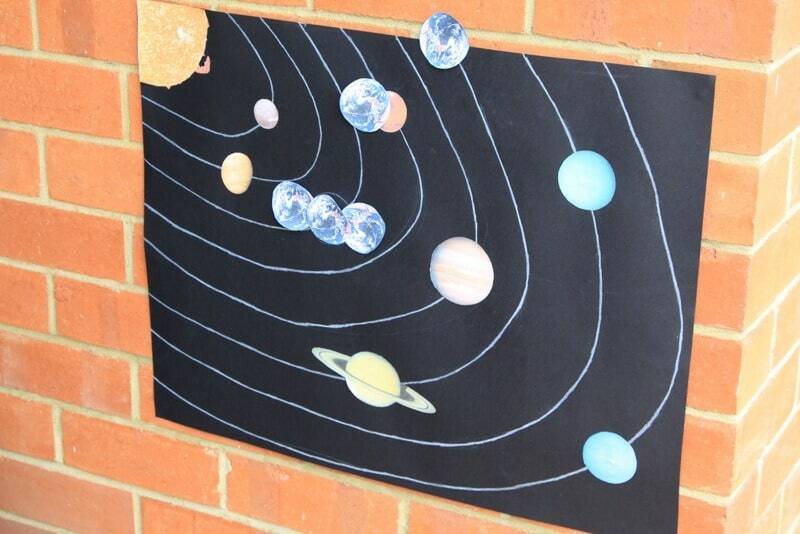 I was going to print out planets and place them on the ground. When the music stops, the kids have to stand on a planet. Each round, one planet is taken away and the kid who doesn’t have a planet to stand on is out. Since my son’s birthday is in the middle of summer, it’s almost guaranteed to be a hot day. 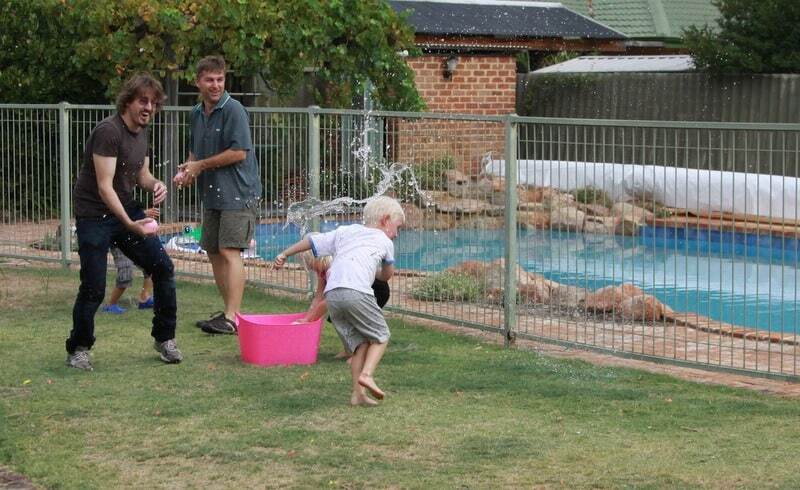 I think I’ve started a tradition of ending his party with water balloons (until he’s old enough to have pool parties – I’m not dealing with that yet!). 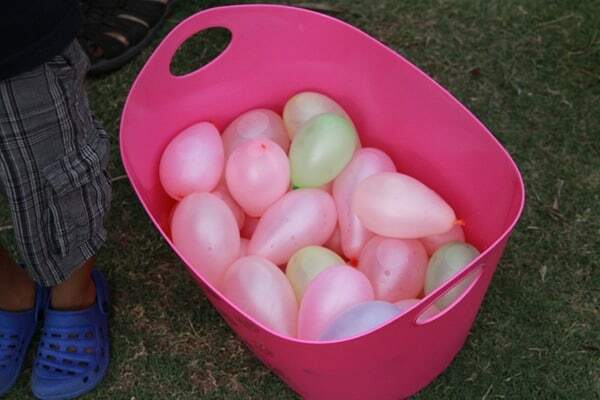 I filled up a big stack of water balloons and placed them in too buckets. We split the kids into two teams, standing a couple of metres apart (so no one would get hit too hard!). The kids then just pelted each other until the balloons ran out (and they get through a huge stack fast!). I had an idea to make the water balloons a “Run through the Asteroid Belt” game, with each kid taking a turn running through while the others threw water balloons, but it seemed more fun as a free for all. If it’s not hot, you could play the game with balls – a space version of dodge ball. So that was the planned activities for the party. The kids had time to run around and make up their own games too. The time flew, and the kids looked like they had a lot of fun. What a fun party! Love the moon rocks treasure hunt! Thanks Louise! The kids had a great time. Great ideas. I am featuring the moon rocks treasure hunt in a space party roundup if you don’t mind.